Men and women are as different as day and night. Not only are we. obviously, physically different, we think differently and we see things differently. What a man may see as showing love, a woman may see as being childish or rude. What a woman sees as showing love, a man will probably see as crazy. We are just different. Author Gary Chapman's 5 Love Languages for Men is a great tool for men. 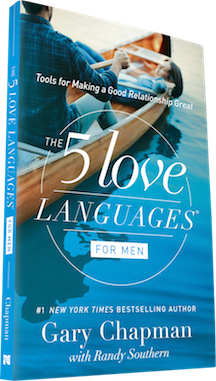 Chapman gives practical and effective ways for men to learn to speak the love language of their wife. Not only is it great for husbands, but men can put these methods to practice in all of the relationships in their life. With drawings throughout the book, it gives visual learners something to enhance what they are reading. Each chapter ends with a phrase guide to give men great ideas. It's hard to know what makes a woman tick. 5 Love Languages for Men is a great book that gives ideas to learning your wife's love language, learning your own love language, how to apologize, how to deal with anger and much more. I highly recommend this book for all men! Check out 5 Love Languages for Men for your husband and be sure to check out 5 Love Languages for marriages and parents. You can also go to 5 Love Languages to do your own love language profile and find out what your love language is.